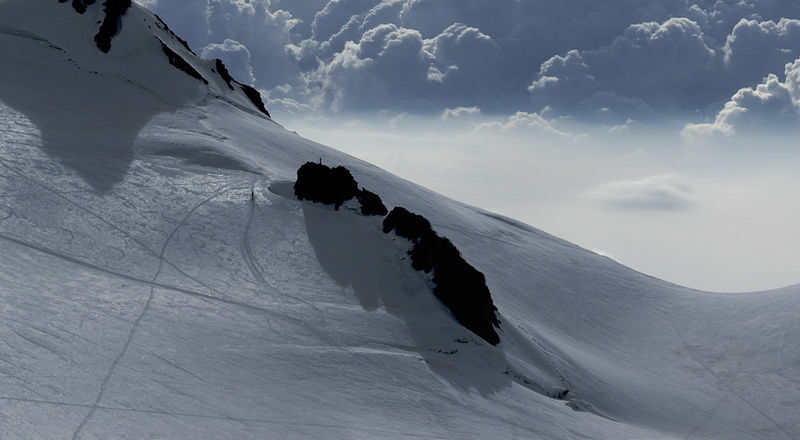 The Balmenhorn is usually tackled along with other peaks of the Monte Rosa massif. Is the Balmenhorn really a 4,000-metre mountain? Is Zermatt surrounded by 38 mountains above 4,000 m or only 29? On the Balmenhorn, one can see it’s not so easy to decide. This 4,167-metre peak lies on the Italian side of the Monte Rosa massif, which has ten clearly defined 4,000-metre summits. The Balmenhorn is on the so-called extended list of 4,000-metre summits. No wonder: this outcrop has a prominence of only 12 metres, can be climbed via a secured pathway and is difficult to make out visually against the crevasse-ridden Lys Glacier. According to the UIAA (the International Mountaineering and Climbing Federation), there are (1) topographical reasons, (2) morphological reasons and (3) climbing reasons for considering a mountain to be a “real” 4,000-metre summit. But the Balmenhorn has the feel of a 4,000-metre peak – its height alone is enough! The Monte Rosa massif has about ten summits higher than 4,000 m: Dufourspitze, Grenzgipfel, Ludwigshöhe, Nordend, Parrotspitze, Schwarzhorn, Signalkuppe, Vincent Pyramid, Zumsteinspitze. “Balmen” are cave-like overhangs at the foot of cliffs. The word may derive from the language of the Walsers, and is also encountered in Walser regions in Graubünden and the Vorarlberg. It is thanks to a four-metre high bronze statue weighing a ton that the rather inconspicuous Balmenhorn has achieved an additional importance related neither to topography, morphology nor mountaineering. It was the solid rock base of this summit that led the Turin artist and partisan leader Alfredo Bai to place his statue, created from war scrap, on the Balmenhorn. During the Second World War, Bai made a vow to place a statue on one of the 4,000-metre summits as a symbol of peace, in memory of all victims irrespective of their nationality. The statue, called “Cristo delle Vette” (“Christ of the Summits”), was dismantled into eleven parts for transport here by 35 mountain soldiers originating from all the provinces of Italy. The raw material for the statue was donated by the Italian Ministry of Defence; the final work was unveiled in a solemn ritual on 4 September 1955. In 1954, the twin town of the municipality at the foot of the Monte Rosa erected another statue, “Christ of the Abyss”, on the sea bed in the Bay of San Fruttuoso. This project was initiated by Duilio Marcante in memory of Dario Gonzatti, who died in a diving accident in 1950. With the help of the Italian navy, the statue was lowered to the seabed at a depth of 17 metres close to the Abbey of San Fruttuoso, between Camogli and Portofino, on 22 August 1954. The statue of Christ, about 2.5 m tall, was made by the sculptor Guido Galletti; the bronze for the statue was cast from medals, propellers from US Navy submarines and church bells. As a sign of peace, the hands of Jesus are raised towards the surface of the sea. In memory of Marcante, a commemorative plaque was placed on the base of the statue after his death.